That Was The Year! Recreating notable events of passing time, reviving memories of men and women who have contributed to the history of a modern world! 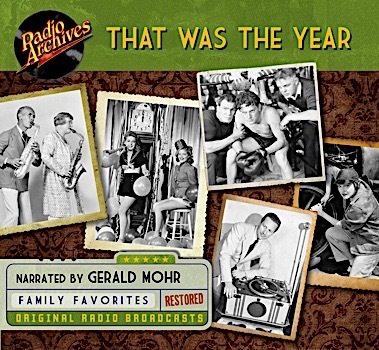 That Was The Year is another of the rare Transco syndicated series expertly restored to Sparkling audio quality by Radio Archives. First heard in 1937, That Was The Year consisted of 39 fifteen minute long shows featuring historical vignettes dramatizing key moments in the lives of men and women whose contributions were significant in the history of the modern world between the years 1896-1934. For a show that precisely chronicled historical worldwide events that occurred throughout a given year, That Was The Year, was never aired in any specific chronological order. One week listeners would be hearing the defining events of 1934, while the next week listening to the historical events of 1897, and then jumping forward the following week to 1912. Among the intriguing historical nuggets listeners to That Was The Year heard, were the faithful recreation of the first demonstration of a television broadcast in 1927, who made the first transcontinental telephone message in 1915, and how the Republic of China was established in 1912. Each show segment ended by playing for listeners a song that had been popular in the year just chronicled. “Lazy Bones” ended the 1933 segment, while “Roses of Picardy” closed out the show for 1918. Gerald Mohr narrated the entire series, which was produced by Transco and recorded at KHJ in Los Angeles, with Lindsey MacHarrie serving as the program’s announcer. Jay Novello and Gale Gordon were amongst the series regulars. First heard in syndication in 1937, all 39 episodes of That Was The Year, continued to be played on radio stations for decades. "Cairo, gateway to the Ancient East...where modern adventure and intrigue unfold against the backdrop of antiquity..."
Listening to broadcasts from the Golden Age of Radio today, it's interesting to note that many OTR favorites were often heard only in certain regions of the United States. The best example is The Whistler which, despite its longevity, was heard solely on the west coast for all but a season or two. Other examples of west coast dramas include detective shows like Mutual's Let George Do It, NBC's Candy Matson, and the CBS series Jeff Regan, Investigator. 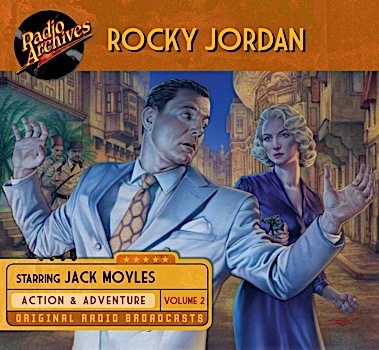 Rocky Jordan, a distinctively different-sounding detective offering heard over CBS Radio's Pacific network from 1945 to 1950, is one more member of this elite broadcasting fraternity. A series that could be described as a mixture of Casablanca and The Maltese Falcon, Jordan debuted on January 8, 1945 as a five-day-a-week quarter-hour serial entitled A Man Called Jordan. The titular hero, portrayed by radio veteran Jack Moyles, owned and operated an Istanbul dive dubbed the Café Tambourine and, though described by OTR historian John Dunning as "a hero in the I Love a Mystery mold," was actually a shrewd businessman motivated more by the financial bottom line than cheap sentiment. Still, he had a knack for frequently getting involved in mystery and murder and often depended on a colorful cast of sidekicks - his "man Friday" Ali (Paul Frees), girlfriend Toni Sherwood (Dorothy Lovett), and trusted pal Duke O'Brien (Jay Novello) - to assist him in his amateur investigations. A Man Called Jordan switched to a weekly half-hour format beginning July 2, 1945, and entertained West Coast audiences for approximately two years. Apparently, Mr. Jordan took a year off to relocate the Café Tambourine to Cairo when the program returned to CBS on October 31, 1948. Apart from the new location, it was business as usual for 'the Rock' as he fought escaped killers, desert raiders, ex-Nazis and black marketers on a weekly basis. It was with this show's incarnation that the comparisons to Casablanca were particularly apt; Jordan would often have to depend on his police force ally Captain Sam Sabaaya (also played by Novello) for assistance. Though the two men clearly respected one another, they often found themselves sizing each other up in the same skeptical fashion as Rick Blaine (Humphrey Bogart) and Captain Louis Renault (Claude Rains) did in the Oscar-winning film classic. Argosy magazine was arguably the greatest all-fiction pulp title ever. It serialized some of the top fantastic and adventure fiction ever committed to paper during its long and glorious run. The Tarzan stories by Edgar Rice Burroughs and the superlative fantasies of A. Merritt went on to become enduring classics. As did C . S. Forester’s Horatio Hornblower novels. One of the top serials to grace the pages of this mighty magazine was Loring Brent’s superb The Sapphire Death. Its hero, Peter Moore, also known as Peter the Brazen, had first appeared in its pages back in 1918, and was revived in 1930 for a new series of stories. 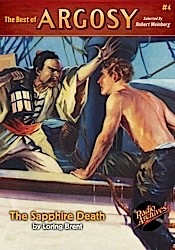 His two-fisted exploits in the Far East became among the most popular tales ofArgosy’s 1930s era. Peter the Brazen first encountered the mysterious Mr. Lu, the Man with the Jade Brain, in the short story of that same title. Further battles followed, as in “Cave of the Blue Scorpion,” and its sequel, Sting of the Blue Scorpion. Together, those last two tales comprised our first Best of Argosy audiobook release last year. You demanded more, so Robert Weinberg decided to hit you between the eyes with one of his favorite serials––which is by no means a minority opinion among pulp fiction aficionados. In The Sapphire Death, Peter the Brazen is thrust by a powerful urge for revenge into a final showdown with his diabolical arch-foe and, knowing that it will be the battle of his life, undergoes a regimen of physical and mental training calculated to transform him from the Man of Bronze into the Man of Chromium. Yes, Peter the Brazen becomes a superman, fully prepared to destroy the Man with the Jade Brain. One wonders if author George F. Worts––to give his real name––had noticed the adventures of Doc Savage, the other Man of Bronze, a superman who had been raised from the cradle to battle wrongdoers and who came along early in 1933, and decided to outdo Doc by transmuting Peter the Brazen into a hero of brighter metal than bronze. If so, the The Sapphire Death is his answer to Lester Dent. This novel was serialized from June 10 to July 15, 1933, and stands as an epic achievement in heroic pulp adventure fiction. A tremendous read, but which strangely never appeared in hardcover form during the author’s lifetime. We’re proud to present it here as an absorbing audiobook that will keep you enthralled from start to finish. 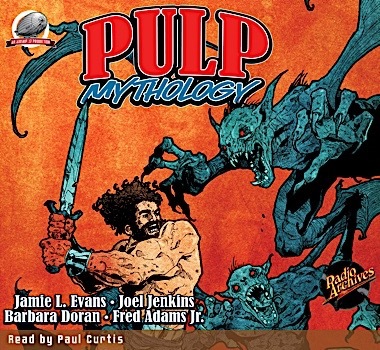 If you don’t love his story, you don’t love pulp! Bob Weinberg says so! Clad in a shimmering evening gown, a black domino mask offsetting her golden blonde hair, daring socialite Ellen Patrick takes the trail to crime, motivated by the murder of her father, District Attorney Owen Patrick. Since the Hollywood beauty suspects that a powerful state political machine was responsible for her father’s assassination, she targets high-society crime exclusively, hoping to bag a big shot. 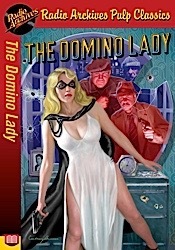 In the tradition of pulp heroes of that era, she left behind her calling card, which read Compliments of the Domino Lady. That famous masked protector of California, Zorro, would have recognized her M. O. instantly. The self-described “young avenger” appeared in every issue of Saucy Romantic Adventures until it folded with the October, 1936 issue, popping up in Hollywood, San Francisco, and on the high seas, in her pursuit of swift justice. A month later, glorified by a stunning Norman Saunders cover, she made her final bow in “The Domino Lady Double,” for the November, 1936 Mystery Adventure Magazine, where she matches wits with an equally gorgeous impostor. $2.99. Only three candidates for Mr. Lu’s priesthood had survived the tests; and one of these was Peter Moore, better known to the Orient as Peter the Brazen. It would take a superman to conquer the Blue Scorpion — and Peter the Brazen, secret avenger, trained to become that superman. Torn from the pages of the first and foremost pulp magazine, the fabled Argosy, and chosen from among thousands of stories by premier pulp authority, Robert Weinberg!Argosy magazine was the first and most influential pulp magazine of the 20th century. At its height, it was published each and every week, and contained a veritable cornucopia of fabulous fiction in all genres. Detective and mystery stories. Westerns. Love stories. Sports. Even science-fiction and fantasy filled its pages. Esteemed writers ranging from Edgar Rice Burroughs to Erle Stanley Gardner graced its beloved pages. Now Radio Archives is delving into the pages of this celebrated magazine in an effort to present some of the best feature fiction Argosy presented during its near-century of publication. Overseeing this production is one of the great scholars of the pulp era, novelist Robert Weinberg. 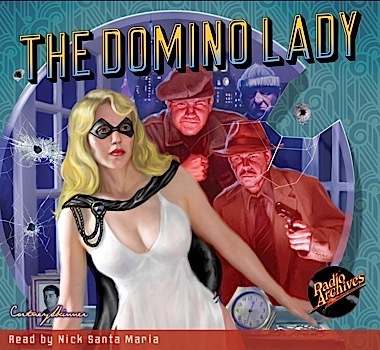 “Radio Archives is issuing the best of the pulps in audio and eBook format,” he says. “It’s a pleasure to work with them, bringing back some of the greatest action fiction ever published for modern fans!” $2.99. Horror Stories! The dark companion to Dime Mystery Magazine. Created to showcase stories too horrible for Terror Tales. The third of the triumvirate of fear pulps. 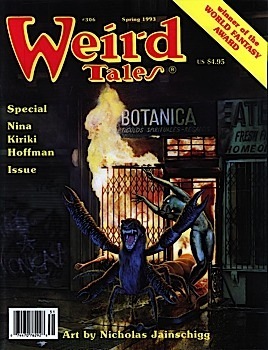 This brand of fiction came to be called Weird Menace. The mystery-and-menace formula proved so successful that publisher Popular Publications produced Dime Mystery Magazine, Terror Tales and Horror Stories.These three dominated the Weird Menace genre all through the 1930s. 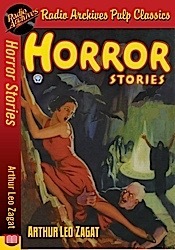 Blurbed as “mystery-horror” stories instead of “mystery-terror,” Horror Stories was formulated differently that its companion titles. Damn the plot. Pour on the menace! This eBook contains a collection of stories from the pages of Horror Stories magazine, all written by Arthur Leo Zagat, reissued for today’s readers in electronic format. $2.99. Dime Mystery Magazine was one of the most popular of the shudder pulps. It began in 1932 under the title Dime Mystery Book Magazine. 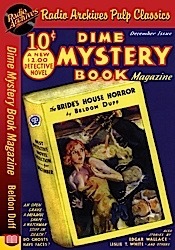 Dime Mystery Book Magazinemade its debut in December of that year, offering readers "a $2.00 mystery book for only ten cents!" After eight issues the title was changed to Dime Mystery Magazine, a title it kept until the end of 1949. In late 1933, weird menace began to creep into the series, and it is today best remembered for that type of story. But for the first few issues, the magazines each featured a single novel-length story that were more standard murder mysteries, albeit a bit more grisly. The editors claimed these to be "The best detective fiction your money can buy!" This eBook contains a classic story from the pages of Dime Mystery Book Magazine, reissued for today’s readers in electronic format. $2.99. The Western was coming of age in 1950. It was no longer strictly a ride-’em-cowboy treatise with a shoot-out per page and a carcass per paragraph. It was becoming a realistic, living story of the true drama of frontier America... a credible, vital, true-to-life re-creation of the past, told in terms of the fight for human decency against insurmountable odds in a savage environment. 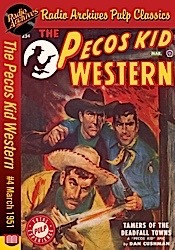 The Pecos Kid was born from Popular Publications in the July 1950 magazine, and was hardly a regulation Western character. Dramatic clashes did not always break forth in gunfire, but resulted rather in human conflicts that split families up into warring factions, pitted cousin against cousin. Of course, these Western stories still had their sweeping movement, their dramatic impact, their stirring conflicts, and a helping of good lively, he-man brawls. 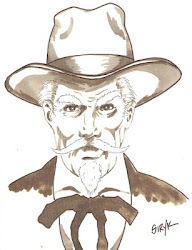 The lusty, hell-for-leather characters of the Old West were still present, with their tough, vigorous ways and their crisp, salty talk. After five issues under its own title, The Pecos Kid Western merged with 10 Story Western Magazine in mid-1951. The Pecos Kid series returns in vintage pulp tales, reissued for today’s readers in electronic format. $2.99. 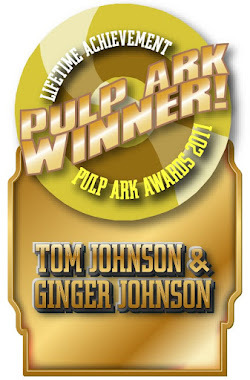 The response to all the new pulp reprints in the last newsletter was so great that we sold out of all of them. A new shipment arrived yesterday and there is plenty of inventory for everyone. All back issues of Doc Savage, The Shadow, The Avenger, and The Whisperer have also been restocked and ready to ship to you today. Your extremely prompt and helpful customer service is yet another reason to stick with Radio Archives as the source for the old time radio shows and audio books. Radio Archives versions seem to be "cleaner" restored versions -- easier to listen to than the raw freebies available on-line. Add to the cleaned/restored shows the fact that you don't sell bits & pieces of incomplete serials shows and also that you provide prompt and meaningful customer service -- why would a customer want to go elsewhere? First of all, thanks for making all of the CDs that you do – it is very fun to listen to old-time radio as well as the new audiobook productions of pulp novels.